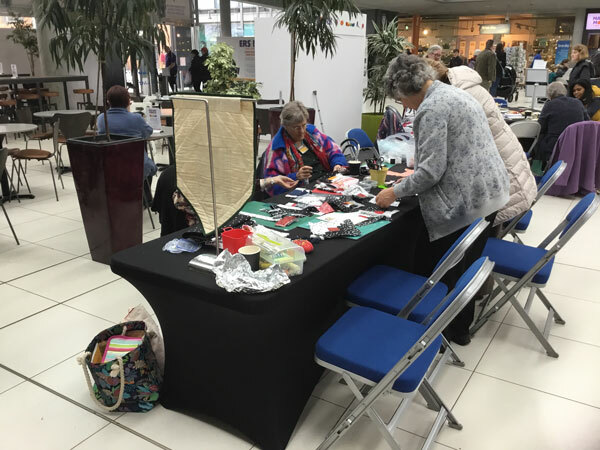 Norfolk Quilters spent a week at the Maker’s Month at the Forum in Norwich from 12th March to Saturday 17th March 2018. We attended this event to encourage new members and show members of the public what we do. I would like to thank everyone who volunteered to take part in helping at this event and supported us there. At this point I would like to ask if any member would like to help us next year please get in touch with me, it is rewarding, a fun day and you get to meet a lot of new people. We had an extremely successful week and signed at the event or as a result of the event 18 new members. We did not make as much money as we did last year; this was due to the cancellation of two workshops because of lack of interest. However, we did have a lot of interest in our group. At some times we had large groups of people having a go at patchwork, talking and showing a lot of interest in the group. 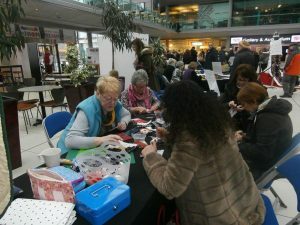 We had mostly three/four members at a time helping and showing people how to sew. On Saturday it was extremely busy and we were kept hard at work. The youngest person to try to sew was three and there were many more that had a go at our log cabin quilt. 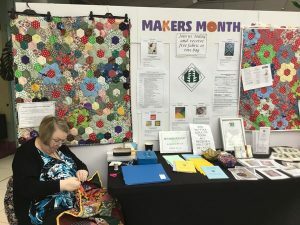 Next year the Maker’s Month is going to take place at The Forum for only two weeks and there will be a marquee outside the building with underfloor heating. It starts on 9th February 2019 for two weeks. 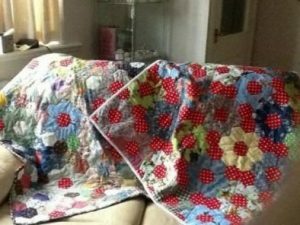 The two quilts we made last year for the Project Linus will be handed over within the next few weeks. We still have to put together the blocks we made this year. 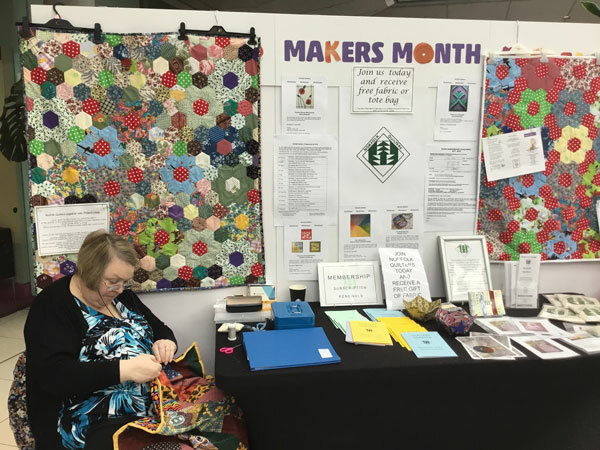 These are the 2 quilts made from the hexagons at the Forum in 2017. They have now been handed over to Norfolk Project Linus. 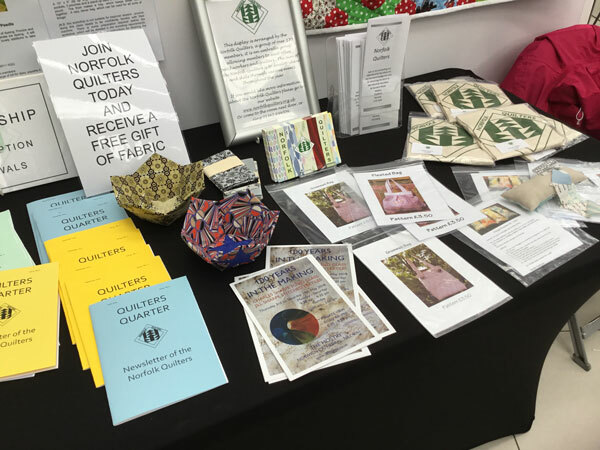 To submit articles or diary dates here on our web site or in our newsletter, the Quilters Quarter, please email the website editor or the Quilters Quarter editor ... Or Both! Or, maybe you just want to add information or photos to content that's already here on the site email the web editor. Norfolk Quilter members to be Blog contributors. Training will be given. If you would like more information or would like to volunteer, please contact me.